Hollywood (July 31, 2018) – For 90 years the home of the most important events in cinema, the famed TCL Chinese Theatre Hollywood hosted one of the most important esports tournaments of 2018, the debut Arena of Valor World Cup on July 27 and 28. 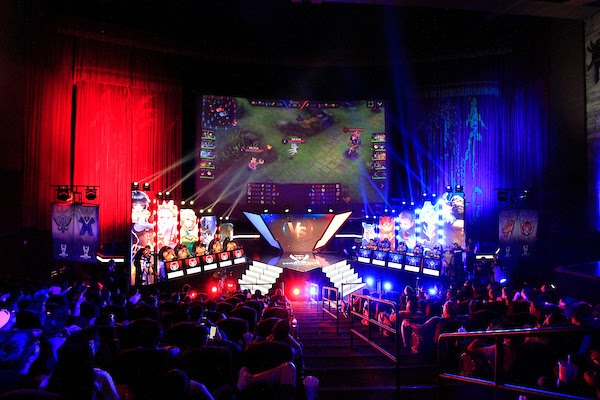 “Arena of Valor” is the world’s top grossing video game, played in 100 countries, and it was the centerpiece for a first-of-its kind world class competition in Hollywood at the TCL Chinese Theatre’s IMAX theatre, lavishly converted over a week’s time into an Esports Arena. Over 10 million people across the globe play “Arena of Valor” every day. It’s the world’s highest grossing game and most popular free app. Competitors at this past weekend’s TCL Chinese Theatre IMAX® event were chasing $550,000 in prize money and gamers the world over followed the competition’s live stream on Twitch.tv/ArenaofValor, YouTube.com/ArenaofValor, and Facebook.com/ArenaofValor. The Korean team won the competition’s World Cup Prize. The newly-configured TCL Chinese 6 theater—FIRST OF ITS KIND IN HOLLYWOOD—functions both as an MX4D® MotionEFX movie theatre, as well as serve as the first immersive spectator theater, hosting competitive esports tournaments. The venue was built by MediaMation, Inc.
Hollywood Esports was launched in 2017 as a joint venture between the TCL Chinese Theatres in Hollywood, MediaMation Inc. in Los Angeles, and Wilshire Consulting in Los Angeles, a consulting firm focused on the start-up and funding of new ventures. For press inquiries, please contact Brian Szaks, Hollywood Esports, brian.s@mediamation.com.